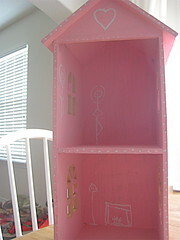 I found this CD shelf in the shape of a dollhouse at Michaels on Clearance for $1.99 . 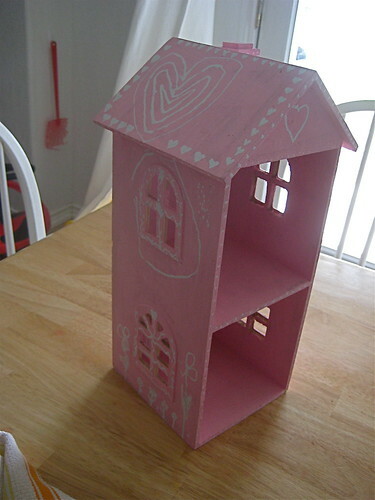 I brought it home and the girls painted it pink - of course. 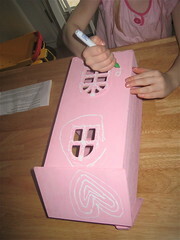 Afterwards, we used white out pens to decorate the house and add details. The pen was easy for my 4 year old to use, but my two year old needed help. It's now ready for our little dolls to enter and play! What do your dolls play in? This is so sweet. You'll have to post a pic of it with characters inside!